Though the owner of the backlog is the Product Owner, who is responsible for collecting user feedback and driving product development, all team members must have access to it and be able to add ideas. Scrum team members should keep technical debt in mind and add suggestions on how to pay it back. When all team members can contribute, the application can benefit from everyone’s areas of expertise. All ideas should be added and can be elaborated on during the grooming meetings. At DragonSpears, we use JIRA for tracking statuses of current development and, just as importantly, storing our ideas. We include screenshots, step-by-step instructions for replicating a bug, or a brief description, whichever is most applicable. Lastly, a healthy product backlog is regularly organized and prioritized. In Agile scrum, this ceremony is called “backlog grooming” and (you guessed it) includes the whole team. Each item is given a priority and a scope and pulled into a sprint when appropriate. You can break items with a large scope down so that they fit into the sprint. The items pulled in are expected to be “done” by the end of the sprint, where “done” is defined by the team and usually means that it is ready for the end user. Backlog grooming is a critical step to ensure that the product owner’s highest priorities are getting the most attention while items that are no longer relevant can expire. Don’t have time for everything? No problem. Just add your notes, and you can review at the next regularly scheduled grooming meeting. With the overall goal being to add value to the product, a product backlog in agile is an invaluable tool for tracking all the great ideas the team has whenever and wherever they arise. 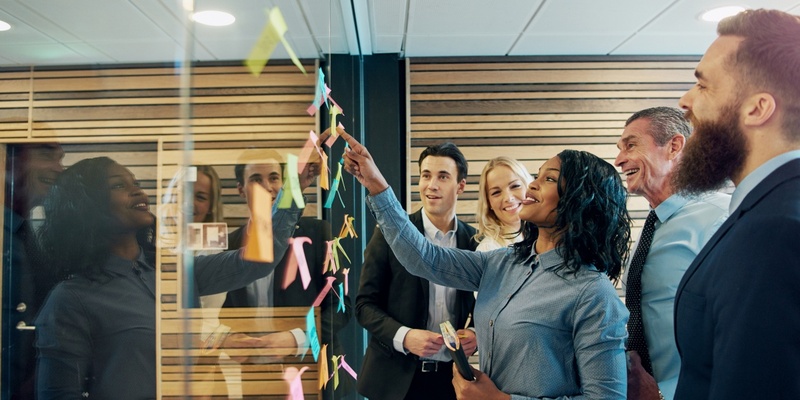 However, ideas alone don’t ensure success: it requires a regular cadence of grooming meetings and excellent communication between team members.